I’ve been a bit busy lately. There’s been visitors staying and people dropping by. I have lots of birthday cakes to bake this month and some recipe testing for a company trying to develop a range of sauces. I feel completely spun out, and I know you are probably the same. There’s always so much to fit in. If you are busy this could be the best way to entertain without too much effort. make this ahead of time and bring it back to room temperature if you like. Be sure to get the eggplant nice and charred and smokey for a really smooth and smokey treat. As a way of encouraging a spare minute and still feeling good about what I am feeding people, I have perfected the quick entrée. It’s also a great way to keep everyone occupied while you sort the rest of dinner or get the drinks. I know it’s just a glorified dip… I’m not trying to reinvent the wheel, but there is some thing nice about sharing platter style. Give it a try and also try this one too. Goat cheese and roasted tomatoes. So I’ll get back to you after this weekend perhaps show you pictures of the birthday cakes made…. 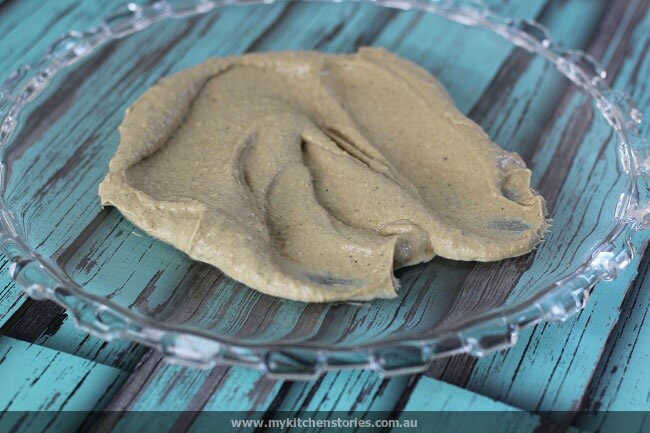 Make this eggplant puree ( babaganoosh) a day or two ahead if you like. The eggplant needs to be smoked. To do this put the whole eggplant over a gas burner turned to medium and let smoke and blacken turning occasionally until it is well charred and softened. Put onto a tray and bake till soft and steamy ( 10- 15 minutes). If you dont have a gas stove put it under a grill and leave to char. Peel the blackened skin from the eggplant making sure that none of the charred pieces are stuck to the flesh, keeping any bits of flesh and liquid. Put into a food processor with tahini, garlic, salt spices & 1/2 the lemon and olive oil blitzing till smooth, taste and add more lemon, oil and salt if needed. It should be smooth and creamy. Heat a frypan and add the spek sautéing till well browned. 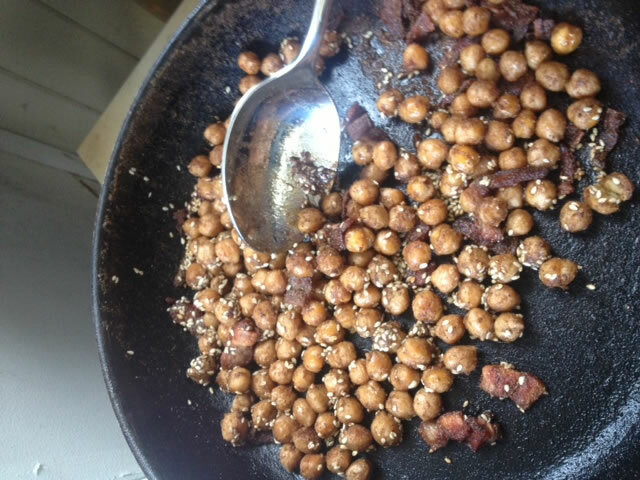 Mop up any excess fat with kitchen paper.Leave the spek in the pan and add the olive oil to the pan then the chickpeas cumin, sesame seeds and a sprinkling of salt. 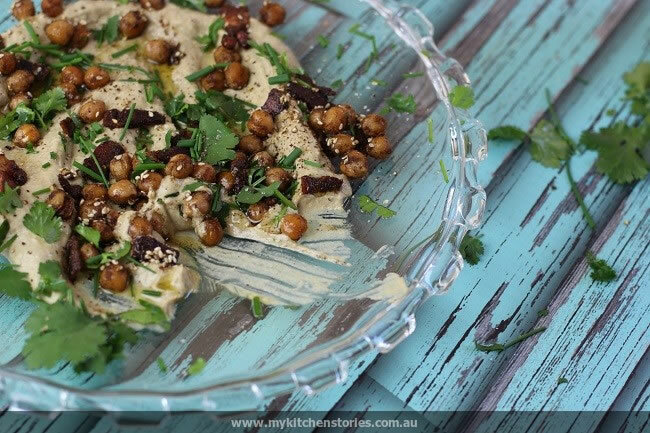 toss this on medium till the chickpeas start to toast and flavour. Taste, it could need more salt or even more oil . Spread the babganoodsh over the base of a platter or plate. 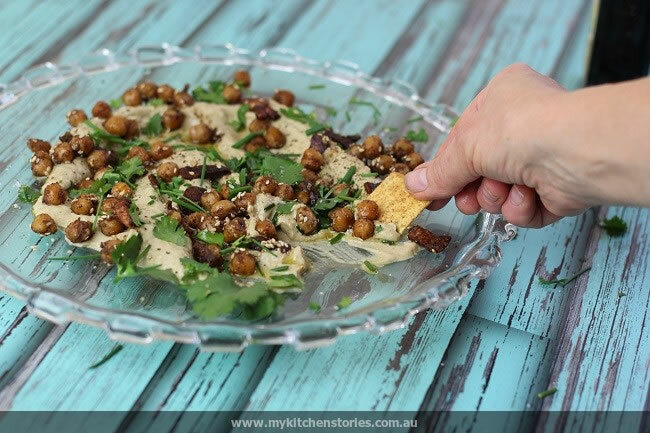 sprinkle with chick peas. Splash over some lemon oil if you have it or just olive oil. Then sprinkle with herbs. 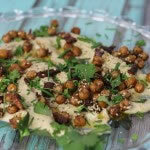 Serve with toasted pita bread or other bread or Turkish bread or crackers. A local Food Tour of Sydney and more hijinx in Malaysia to come. I absolutely love smokey eggplant, by far one of my favourite flavours. I can see how it would compliment speck and chickpeas nicely. I’d love a scoop! Share platters are such a comfy way of serving, and they engage the diners with the food so well, I think it’s a great way to serve up this delicious entree Tania! I’m not a big fan of eggplant any other way than babaganoush. And you know what? I never bake it after I’ve blackened it but I probably should I think. No idea why it never occurred to me…!! That smoky eggplant base sounds amazing! What a great recipe and dish to have on hand when time is short – although I also hope things settle down for you. Brilliant! 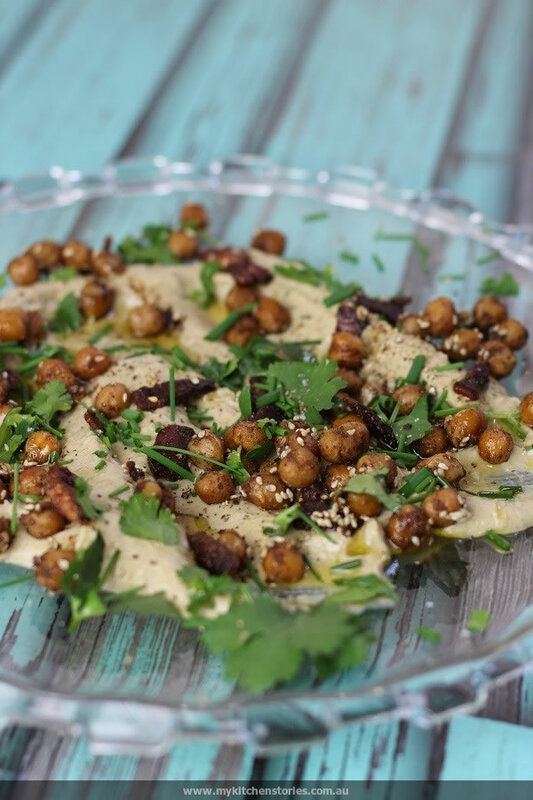 Babaghanoush AND Chickpeas in one! Middle East: listen & learn!! Eggplant is on my forbidden list but I must try it again and see what happens. I do love its versatility. This recipe looks amazing– I can’t wait to try it! Could you recommend (if any) any substitutes for Tahini or Cumin? Hi Tess , there are no really substitutes for the flavours of those ingredients however if you wanted to replace them you for another result , you could use some yoghgurt or pmayonnaise and some curry powder or any other spice you like.